My ultimate goal was to push the limits of my Spanish fluency by engaging as many people as possible but this proved to be a bit of a problem. I don’t know if I’ve got a look, or if it’s my walk, but… before I can ever get a word out of my mouth I’m greeted in broken English with “Hey Bro…” or “What’s up man?” I don’t know. Maybe those are typical greetings that have caught on world wide. When I do speak Spanish, people seemed a bit surprised. I was asked today if I was from Cuba. I loved that! I stopped, he stopped. I had to engage him. He only spoke Spanish. He was Peruvian. He almost flipped out when he heard that I was from Los Estados Unidos, especificamente Los Angeles. He was so engaging that I felt like I had just found a long lost family member. After getting information on restaurants, clubs (which I don’t do), community centers and the like, we parted. But before we went our separate ways, this brother reached out and grabbed me and gave me the hardest hug I’ve ever had from another brother. “gracias hermano, gracias…,” he kept saying as we parted ways. I’m not sure what he was thanking me for but I appreciated it. Wow… that old school nod goes a long way and, apparently, has no language barriers. Oh… before I go, a quick little cultural fact. 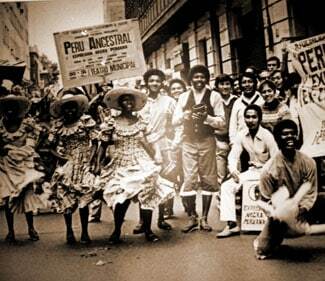 Did any of you ever hear of the tradition here in Peru of Black Men being hired to be the Pall Bearers at funerals? Apparently it is a custom, long standing and the affluent pay very well for this traditional service. Interesting, isn’t it?